Q-Dir, the Q stands for Quadro, is a Windows Explorer replacement that offers all that the default file browser in Windows offers, and then a lot more on top of that. The program is offered as a portable version and installer for 32-bit and 64-bit Windows client and server editions. The reason why the developer has called it Q-Dir becomes apparent on the first start, as it launches a total of four different explorer views in its interface, each with its own file browsing capabilities. The view mode of every instance can be altered individually which makes file operations like copying or moving a lot easier. 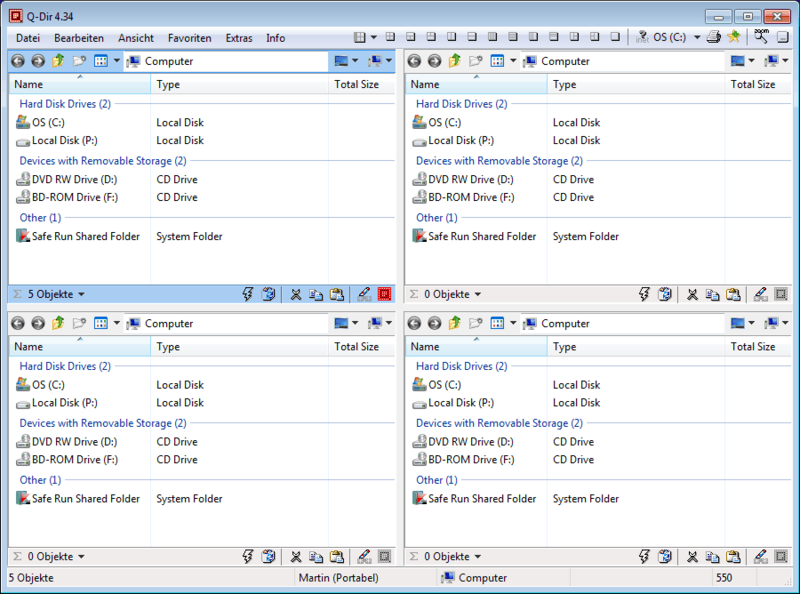 The layout can be altered as well, as it is possible to reduce the number of open Explorer copies and their position in the program interface. It is for instance possible to reduce the number by two, and align the remaining windows vertically instead of horizontally. Even a single file browser window is possible. But the different layouts are just one of the features that Q-Dir has to offer. Q-Dir offers a wealth of additional features besides the standard feature like showing files and folders in different view modes, drag and drop, folder favorites or file sorting that Windows Explorer offers. 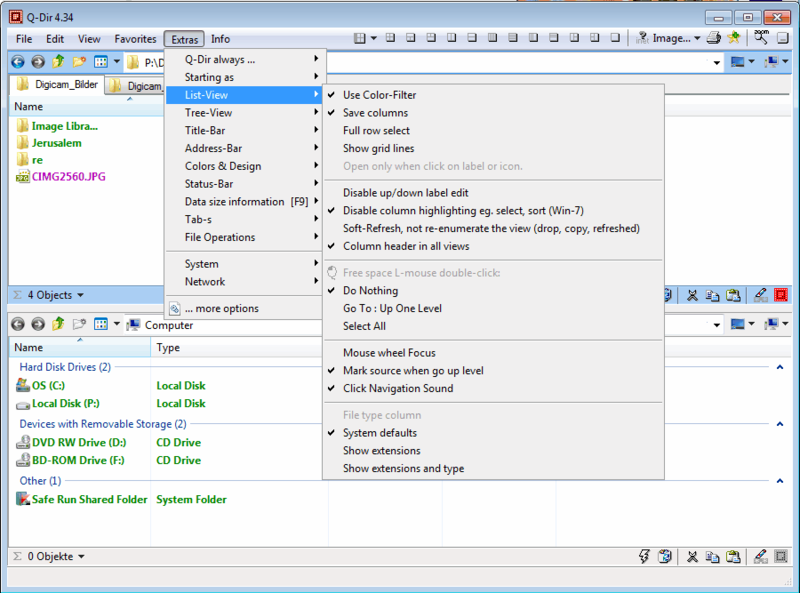 It is furthermore possible to use the items in the Windows Explorer context menu to process files directly in Q-Dir. The additional features include - among others - displaying folder size information, tabbed browsing, printing, a screen magnifier, exporting data and several filters to highlight files or filter the results in the file browser. The display settings and options are very extensive, and it definitely takes more than a few minutes to get accustomed to them. It is for instance possible to enable a color filter for specific file types, define program shortcuts and file associations as well as view modes, and the details that are displayed by default in the program interface. Finally, it is possible to save the current state of the program, to open it at a later time to continue the last session. 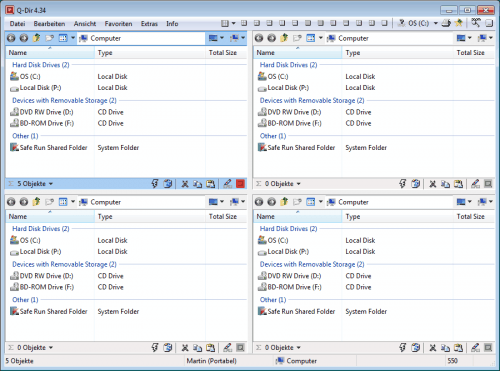 Q-Dir is an excellent Windows Explorer replacement that offers many features that Windows users have requested for some time. The multi-lingual program can be downloaded at the developer's website. It is the best freeware replacement for Windows Explorer. I have been using this little freeware for long and in love with it. Q-Dir is a very fine piece of software. Had been using it for a while too. – tabs were enableb by default. – it had a built-in copy/move like TeraCopy (it bothers me when I’m stuck coppying large files with no more access to the interface until the copy/move is done). I don’t know TeraCopy, but if you’re tired of not being able to access the interface while copying, I can whole-heartedly recommend Total Commander. It has a myriad of useful features – amongst which are background copying and the more advanced copy queueing, which allows you to successively add files to be copied (or moved) to a list which Total Commander then executes one a time so your system isn’t slowed down by many simultaneous copy processes. Total Commander is in general an extremely useful file manager which I’ve been using for upwards of ten years now. It should be noted, however, that the program is shareware, not freeware. Thats exactly what TeraCopy, FastCopy and some others do. And for free. Thanks anyway for the kind suggestion. Couldn’t help but comment on this one. I believe this is the most useful program EVER! @Oneide you should tell that to the developer, he might implement it in next builds. I have been using it for years now and I’m more than pleased. When I do heavy cleaning (I sort more than 100 000 files manually each one) this has no equivalent! Light, useful and gets better! Let a note on the developers site pointing to this blog topic. Use it too for a while now. Found it on the german webside heise.de as top download 2009. Isn’t it amazing that this cool guy can knock out something this excellent in his _spare time_ while MSFT with hundreds of devs and TechNet members leaves us stuck with a mediocre file mgr?